Every year between us all we use nearly one and a half billion plastic bottles in The Netherlands. That equates to more than 80 per person! What do you do with your empty PET bottle? Did you know that PET bottles are 100% recyclable? 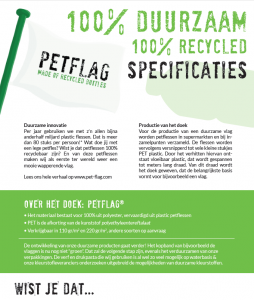 And, did you know that we are the first in the world to turn these PET bottles into lovely, streaming flags? 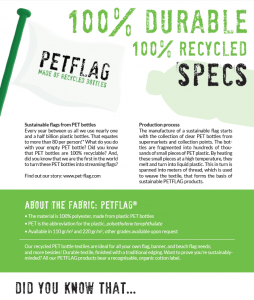 The manufacture of a sustainable flag starts with the collection of clear PET bottles from supermarkets and collection points. The bottles are fragmented into hundreds of thousands of small pieces of PET plastic. By heating these small pieces at a high temperature, they melt and turn into liquid plastic. This in turn is spanned into meters of thread, which is used to weave the textile, that forms the basis of sustainable PETFLAG products. We receive the white textile on a large roll at our factory and print this into your individual, colourful flag! And when the time comes for your flag to be updated, don’t throw it away! Because did you know that your old flag can be used to make a unique bag, trendy laptop case, or even a smartphone cover? Complete the sustainable circle by giving your old flag a new lease of life: benefitting not just yourself, but the environment too! Do you want to know everything about our durable fabric? 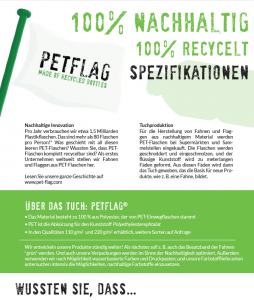 That’s why we’ve designed useful leaflets in 4 languages with all information in detail about the fabric PETFLAG. Please contact us, so we can send you a leaflet in your preferred language! PETFLAG. MADE OF RECYCLED PET BOTTLES. High-quality material. 100% recycled. 100% durable.